So many of my designs and illustrations are inspired by my favourite lyrics, and guess what… this one is as well. 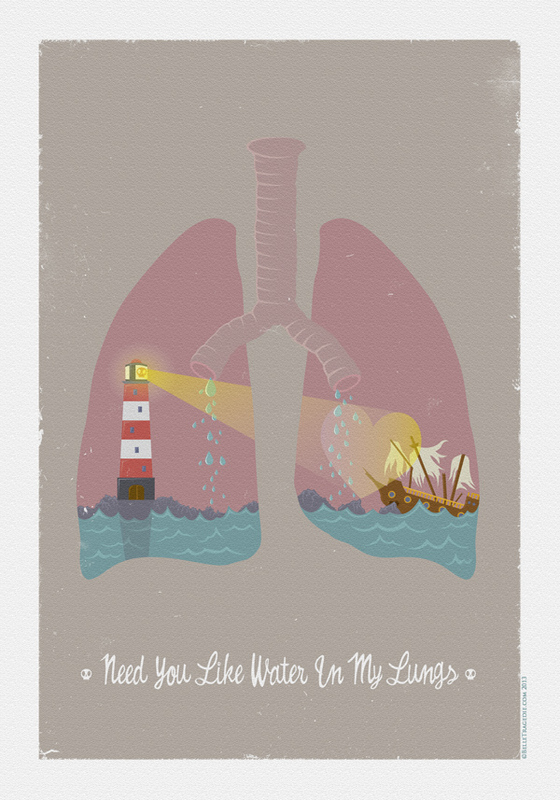 The happily titled “Need You Like Water In My Lungs” is inspired by the lyrics to the song “Play Crack The Sky” by Brand New from their album Deja Entendu. The album has been a big influence and favourite for many people I know and one that I can never get tired of listening to, or try to work out what the hell Jesse means in his metaphoric lyrics. The illustration originally started out, like most of my ideas, on a post it note. I then sketched it out, scanned it to illustrator where it grew into something a little more complexed with rain and blood vessels in the background. I decided to simplify it and tone down the colours. A good decision. Anyone who knows the song and gets the general idea of the song are welcome to comment and let me know how I’ve done in trying to literally paint a picture of what comes to minds when listening to the song.